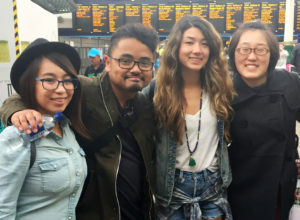 Assistant Professor Brian O’Keefe and five Visual Communications students specializing in Interaction Design went to Edinburgh, Scotland this past summer to participate in an intensive five-day “Blended Spaces” workshop at Edinburgh Napier University. The students – Julius Capio, Jean Chang, Zohal Azimi, Kim Gentry and Genevieve Quiban – also attended the Designing Interactive Systems Conference, where they rubbed elbows with Interaction Design researchers, practitioners and academics. Professor O’Keefe chaired the workshops. At the conference, students attended workshops led by Swedish car company Volvo; faculty from University of California, Berkeley; Open Lab faculty from the University of New Castle, and designers from Facebook London.